Mix marinade together and put aside. Butterfly the chicken by using a pair of kitchen shears/scissors to cut along the backbone of the chicken. Then flatten the chicken out and place in a roasting pan. 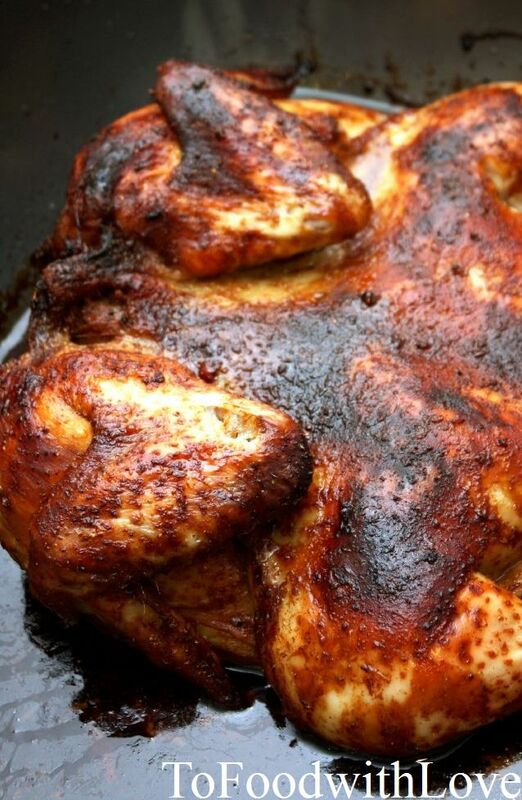 Rub marinade all over the chicken and under the skin. Place a sprig of curry leaves under the skin and another 2-3 sprigs under the cavity of the chicken. Leave to marinade for a few hours. Preheat oven to 200°C. Remove chicken from fridge and leave out for about an hour. Drizzle olive oil all over the chicken and pour 1-2 tbsp of water in the pan to prevent the marinade from getting burnt in the oven. Place tray on the middle rack and roast for about 45 minutes or until juices run clear and skin is slightly charred and crisp. Use a brush to baste the chicken with the marinade in the pan halfway through cooking. When cooked, remove from oven and rest for 10 minutes before serving.